Demolish, convert, or renovate in line with historic preservation principles after all: On the problems in dealing with the architectural legacy of the 1960s. German post-war modernism, until now a pet issue of architecture enthusiasts, is currently in the focus of public perception. Above all, how to deal with the massive housing complexes, concrete-laden cultural buildings and automobile-compatible city centres of the 1960’s is undergoing vigorous debate: is the radical form, the will to densification of city centres, the use of steel, glass and concrete something visionary, the reflection of a future-oriented time and therefore absolutely deserving of preservation? Or is rigorous remodelling or even demolition not only permissible, but also necessary to reduce these buildings, often said to be “dehumanising” in the German public as well, to smaller scales and thereby align them more with people’s needs? Hermann Henselmann, Haus des Lehrers | Photo: Gisela Dutschmann, 1965, © Berlinische Galerie There were a lot of open spaces in Germany due to the Second World War, in a few cities there was even space for new city centres. 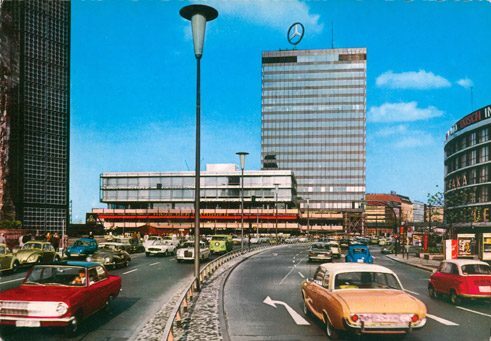 Kassel, for instance, was completely redesigned and acquired the first German pedestrian zone (1969). In construction policy, the focus was on densification of city centres. In the West, in the course of the economic upswing, large-scale office buildings and new university complexes were arising everywhere. Helmut Hentrich, for example, erected the Dreischeibenhaus in Düsseldorf (1960) and Ruhr University in Bochum (1964-74). Cultural buildings such as Werner Düttmann’s Akademie der Künste (1958-60) and Fritz Bornemann’s Deutsche Oper (1961) had already been built before them. 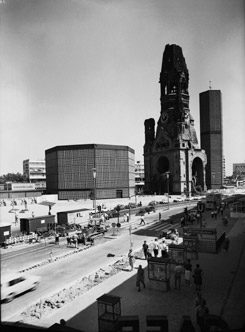 Egon Eiermann, Neue Kaiser-Wilhelm-Gedächtniskirche | Photo: Otto Barutta, 1963, © Berlinische Galerie In addition, a range of government buildings such as Sep Ruf’s Kanzlerbungalow (1966) were required for Bonn, the new West German capital. 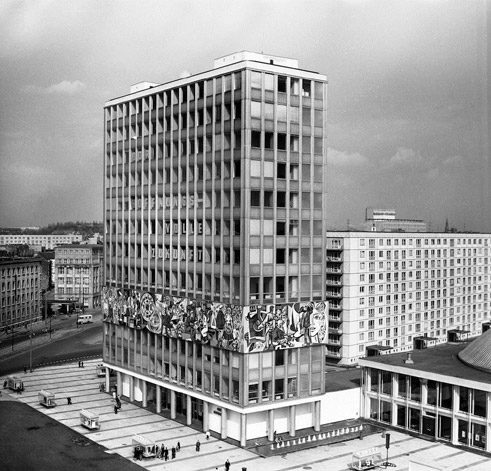 Respective new centres were being designed in Berlin, divided since 1963; one a socialist, the other a capitalist version. In brief: throughout Germany, more construction was underway than ever before, with abundant experimentation with concrete facades, prefab elements, glass blocks and grid architectures. It was a time of radical, visionary designs in East and West, in which buildings arose that today in part enjoy iconic status, as in East Berlin Hermann Henselmann’s Haus des Lehrers (1964), or Josef Kaiser’s Kino International (1963). In West Berlin Egon Eiermann’s Neue Gedächtniskirche (1961), Hans Scharoun’s Philharmonie (1963) and Mies van der Rohe’s Neue Nationalgalerie (1968) stand out. Television tower with a view to Marienkirche | Photo: unknown author, about 1970, © Berlinische Galerie Today, many of the less-prominent buildings are under scrutiny or have already been demolished. The reason is not only size, form or “inhospitableness,” but frequently just poor construction quality. Even experts and building-culture intermediaries tirelessly dedicated to gaining acceptance for these buildings have clearly designated “inferior materials technology” (Wolfgang Pehnt) and “high repair and maintenance costs following decades of neglect in maintenance” (Adrian von Buttlar) as a problem. 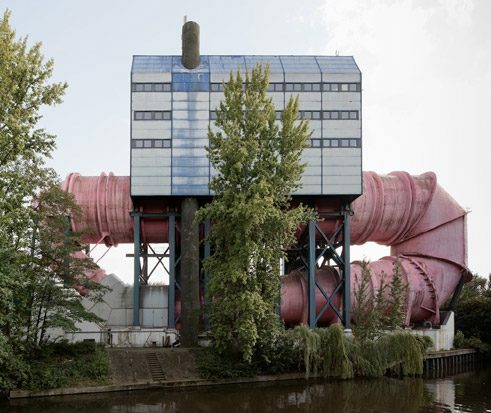 Ludwig Leo, Christian Boes, Laboratory for water engineering and shipbuilding | Photo: Thomas Bruns, 2011, Staatliche Museen zu Berlin, Nationalgalerie However, the date with the wrecking ball is reserved not only for large-scale housing complexes of shoddy construction quality. 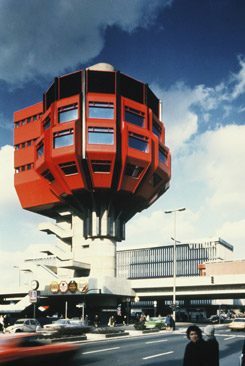 In Berlin, for instance, the large-format restaurant “Ahornblatt” with its legendary shell construction by Ulrich Müther (1971-73) was torn down in 2000 despite being listed under historic preservation. The Schimmelpfenghaus by Sobotka/Müller (1960) at the Zoo underwent a similar fate. Both fell victim to new construction projects. Other buildings from this period are being reshaped – with greater or lesser success. One example is the redesigning of the Kaufhof façade on Berlin’s Alexanderplatz by Jan Kleinhues, who replaced the characteristic aluminium honeycomb facade with natural stone in 2006, earning both applause and vehement rejection in equal measure. By contrast, the restoration in accordance with historic-preservation guidelines of the GDR Staatsratsgebäude (1962-64) by HG Merz (2003-05) and the upgrading of the Deutsche Oper (2011-14) in Berlin are considered examples of overall success. Such restoration, above all meeting the most up-to-date energy standards, might well also have ruined these complex buildings. The costs, however, were high; not many buildings can be refurbished following historic preservation principles in such a fashion. Ralf Schüler, Ursulina Schüler-Witte, tower restaurant Stieglitz, 1972 | Photo: Ursulina Schüler-Witte, © Berlinische Galerie Two more prominent early-1970’s Berlin buildings are awaiting a positive solution: the futuristic ICC Congress centre and the “Steglitzer Bierpinsel” in Pop Art style (both by Schüler/Schüler-Witte). In both buildings, years of neglect have left noticeable effects on their demanding architecture. Although policy-makers have declared their intentions to preserve them, they have yet to produce viable concepts. In particular in the ICC, the Union of German Architects sees an important witness to its epoch and is determined to prevent a demolition like that of the “Ahornblatt.” The discussion revolving around the preservation of post-war modernism might well have just begun in earnest! The pictures in this article were part of the exhibition (catalog) “Radically Modern – Urban Planning and Architecture in 1960s Berlin” that took place from 29 May until 26 October 2015 at the Berlinische Galerie. Iris Braun is a freelance journalist and author who lives in Berlin.